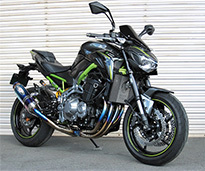 A full exhaust system of Z900 was completed. The name is ‘NASSERT Evolution Type II 3D’. Curved beauty exhaust pipe by 3D vendor who sticks to the shape, it is beautiful appearance of coloring. ･Burning color will be generated in the part where exhaust heat is applied. It exhibits high performance of flat characteristics from low rotation to high rotation. The silencer has a shell length of 300mm and can be selected from two colors, clear titanium and blue titanium. Weight is lighter about 6.0kg than genuine exhaust (about 12.0kg). Slip-on of Z900 was completed. The name is ‘NASSERT Evolution Type II SLIP ON’. The joint pipe is made of Heat-resistant titanium (SUPER TIX@ Titanium pipe), and the silencer is made of Titanium or Blue Titanium. Weight is lighter about 1.9kg than genuine exhaust (about 4.0kg). The standard product is black only in the position plate and the others are silver. 18 Hyper Bank(Fixed foot peg) 0111-KE7-20 ¥56,000 35/12,35/24,47/12,47/24 Disable ※Can be installed with standard brake hose. ※It is only fixed type setting.